Kia has unveiled their 2009 Optima at the New York International Auto Show. The 2009 Optima is your average mid-sized sedan. Design-wise, there's nothing really great about the 2009 Kia Optima, in fact, it reminds me of our old Mitsubishi Gallant that was stolen years ago. 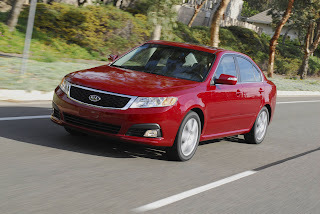 The 2009 Optima will come in two models. One will sport a 2.4 liter four cylinder engine and the other a 2.7 liter V6 engine. The 2009 Optima with the 2.4 liter engine can produce 174 horse power and 169 lb-ft of torque while the 2.7 liter engine is capable of 190 horsepower and 184 lb-ft of torque. No word as to availability and pricing.